Admittedly, I hadn’t even heard of ART|JOG when I booked my flights in and out of Yogyakarta (or Jogja, as locals call it). Even though one of my main goals was to check out Jogja’s vibrant art scene, comprehensive English information about the city’s creative culture is scarce. Before my arrival, it just so happened that I came across something about a large annual contemporary art festival in an old article from 2 or 3 years ago. I dug deeper, only to discover that the grand opening of ART|JOG 10 would coincide with my last day in the country! Luckily, I would just barely be able to make it to what was to be a month-long event. Looking back, I’m very glad I did, as ART|JOG10 would be one of the most memorable parts of my travels throughout Indonesia. ART|JOG originally started in 2008 as a spin-off of something called the Yogyakarta Art Festival, but became its own thing the following year. 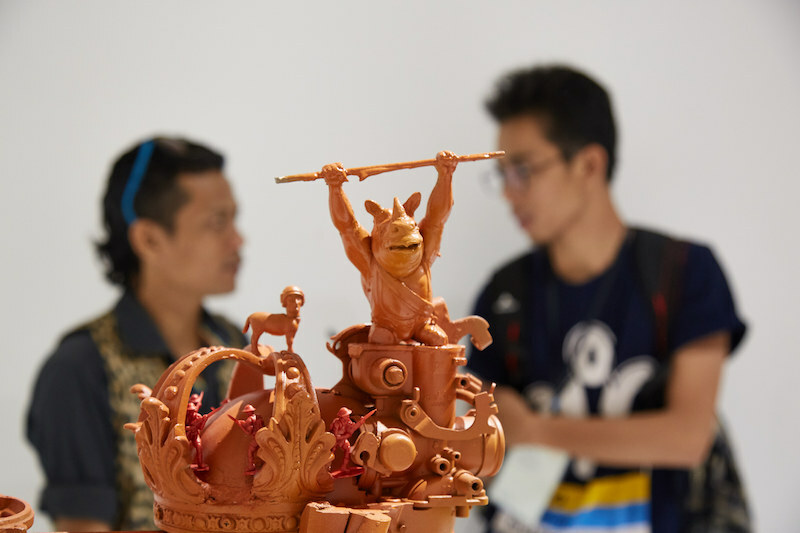 The goal of the event is “encouraging and nurturing new talents in Indonesia visual arts.” The festival is currently the largest annual art exhibition in all of Indonesia. As it grows in popularity, the event continues to attract both people from around Indonesia and throughout the world. This year’s edition took place at the Jogja National Museum, which was once part of Indonesia’s very first art institution. 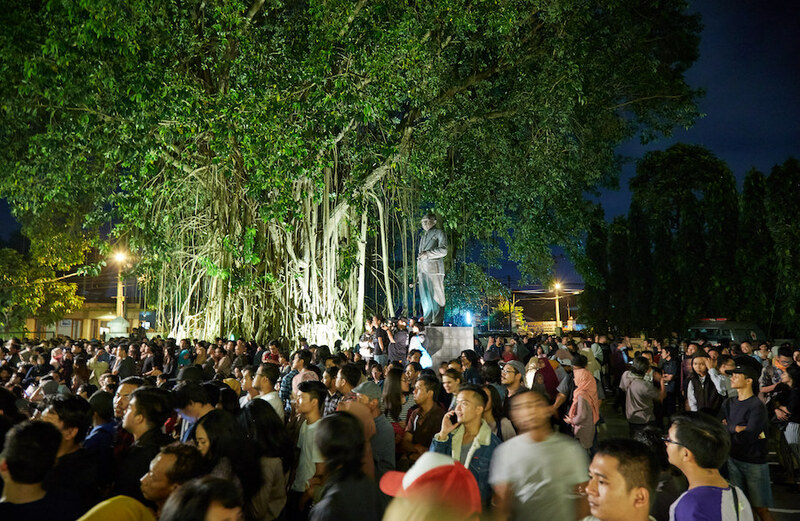 In total, the event featured 59 artists from Indonesia and abroad, in addition to a diverse range of musical acts performing at special events held throughout the month. 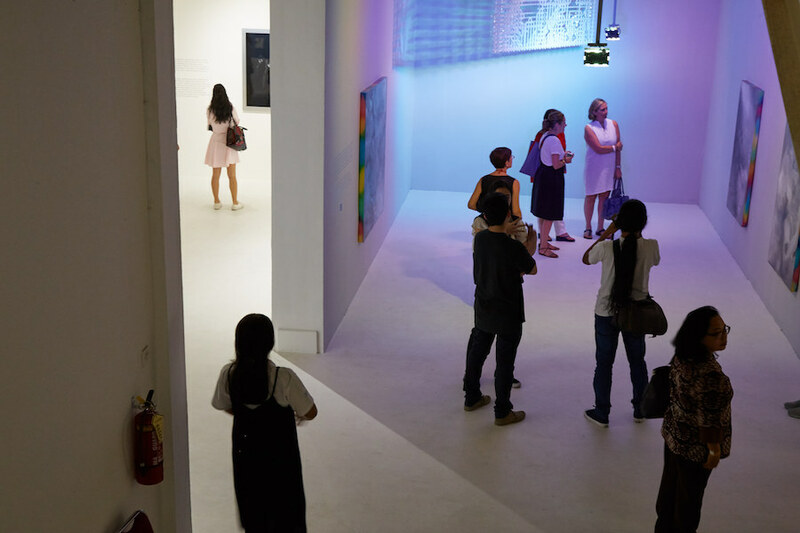 The theme of ART|JOG’s tenth anniversary was dubbed “Changing Perspective.” Appropriately, the event’s official Commission Work to represent the theme was a collection of large, colorful eyeballs. This opportunity was granted to local artist Wedhar Riyadi, considered by many to be a name to watch in Indonesia’s contemporary art scene. Though I had spent the week prior to ART|JOG exploring some of the city’s best art spaces and street art, I wasn’t quite sure what to expect at the big event. Thankfully, I was not disappointed with either the quality or quantity of the works on display. After getting my pass and entering the museum, a colorful, illuminated image of plants, stones and other random objects immediately caught my eye. 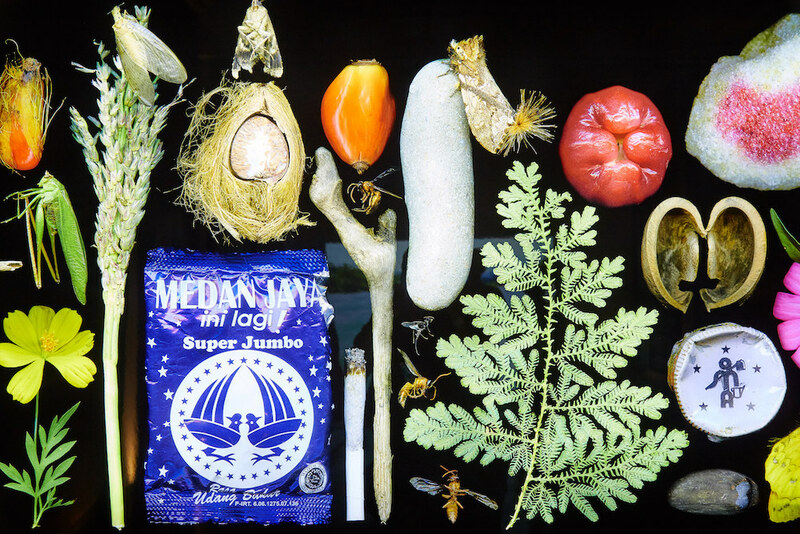 The project, entitled ‘POST JUNGLE,’ was created by Angki Purbandono with assistance from Nicholas Saputra. The piece is an attempt to raise awareness of environmental issues facing communities to the northern region of Sumatra. Standing in the middle of bustling Jogja, the jungles of Sumatra felt like a world away. 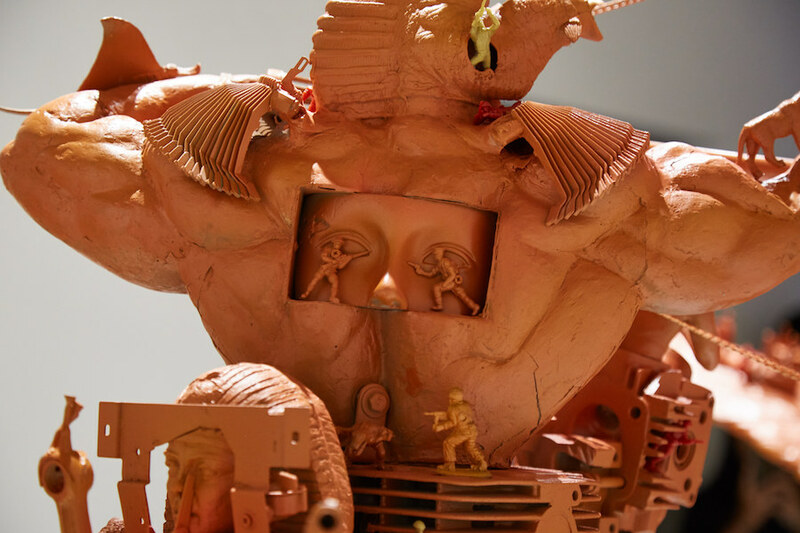 The art piece reminded me of the great ecological and cultural diversity of Indonesia. It was also one of many examples of artists promoting social and environmental issues that I observed throughout my time in the city. Venturing up to the second floor, I quickly discovered one of my favorite pieces of the whole event: ‘Silent Prayers’ by Mulyana Mogus. 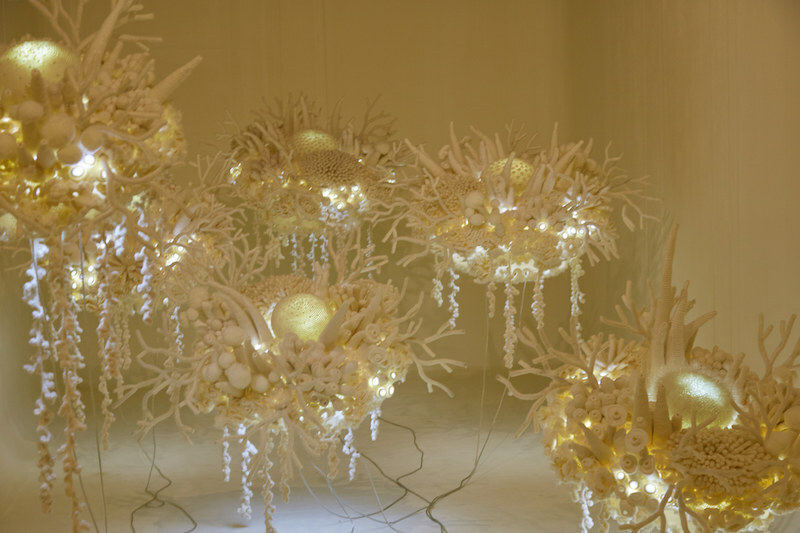 Consisting of material like yarn, iron and beads, among other things, the floating white objects were meant to represent coral under the ocean. This was yet another piece promoting environmental awareness, and as the title suggests, hope and prayer. 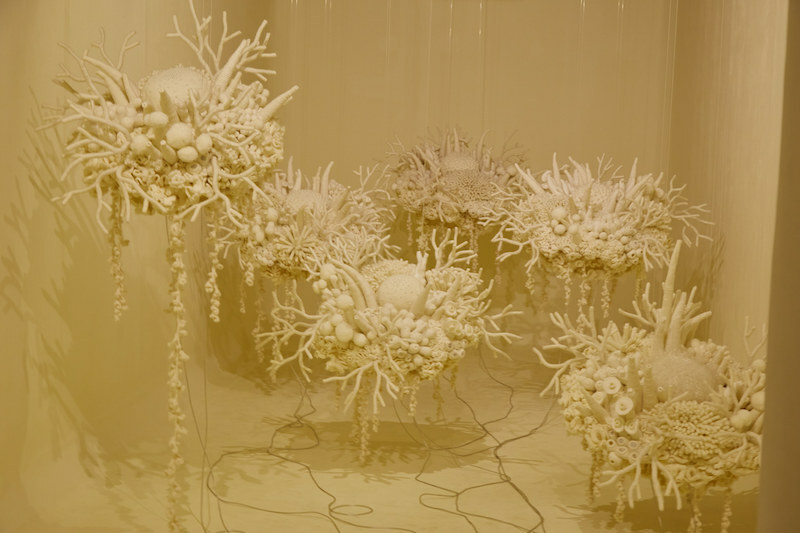 As the room gradually grew dark, the coral also lit up before everything reverted back to white again. This piece consistently attracted large crowds who stood mesmerized by the ebb and flow of the colors and lights. While ART|JOG mainly focuses on local talent, there were also a number of international artists showcasing their work at the event. One that stood out for me was a short film called ‘Mr. Sea’ by Geng Xue of China. 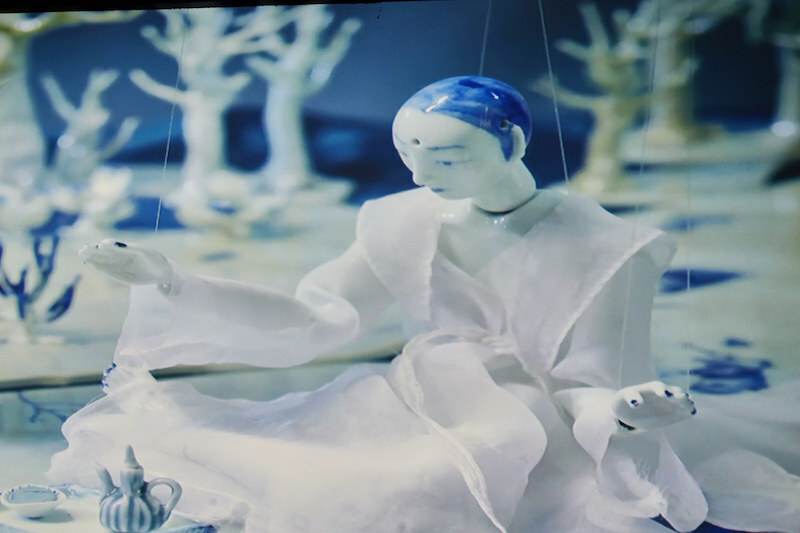 I’ve long been a fan of stop-motion animation, but this 13 minute film was the first I’d seen in which all the characters were made out of porcelain. 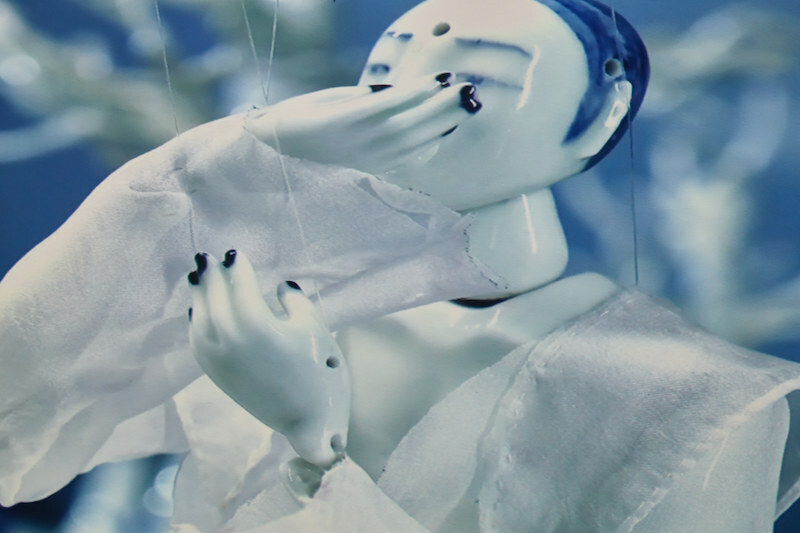 Another work that stood our for me was Hendra “Blankon” Priyadhani’s ‘Fashion as a Weapon.’ The artist created a monochrome miniature world made of toys and action figures that required viewings at multiple angles to truly appreciate. Each angle revealed new details that couldn’t be seen from the other side, giving true meaning to the ‘Changing Perspective’ theme of the event! Outside of the main museum area was a gift shop selling goods by local artists. Even items by those who weren’t featured inside the museum, such as DGTMB, could be purchased here. Nearby, there were also stalls selling snacks, drinks and coffee so it wasn’t necessary to leave the site during the day-long event. Though the inside of the museum wasn’t yet open to the general public on the day I attended, a huge crowd started gathering outside by nightfall. Speeches were being given by the daughter of Yogyakarta’s sultan, among other people, but as I don’t speak Bahasa I didn’t understand them. 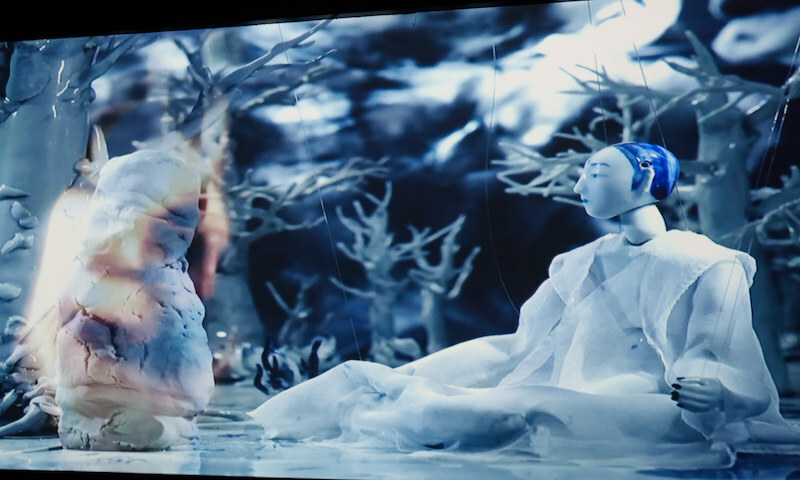 A major focus of 2017’s event was music, cinema and performance art. A large stage was set up outside the museum, and the night I was there featured a performance by the Indonesian band The Doctor and The Professor. Though I wasn’t able to see it, the rest of the month would feature special film screenings and musical performances. Some of the notable acts scheduled to perform were Jogja Noise Bombing, one of the city’s prominent avant-garde and experimental acts, and WVLV, a local electronic music veteran, among many others. 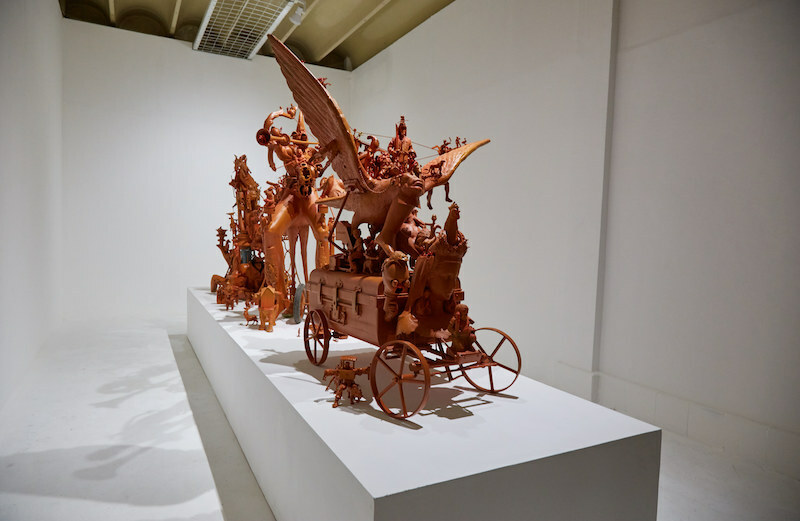 While the opening day of ART|JOG marked a long and eventful month for many, I was already scheduled to fly out of Indonesia the next morning. Though I regret not getting a chance to experience the rest of the festivities that would be happening over the course of the following weeks – not just in the museum but throughout the city – I was grateful for getting the chance to attend the event at all. One thing I’d been hoping for on opening day was to speak with the artists themselves about their work. But there was often nobody standing around the exhibits, or if somebody was, it wasn’t easy to tell whether or not they were the artist. I later learned that there were special days scheduled over the course of the following month, appropriately titled “Meet The Artist,” which would allow audience members to directly interact with the creators. 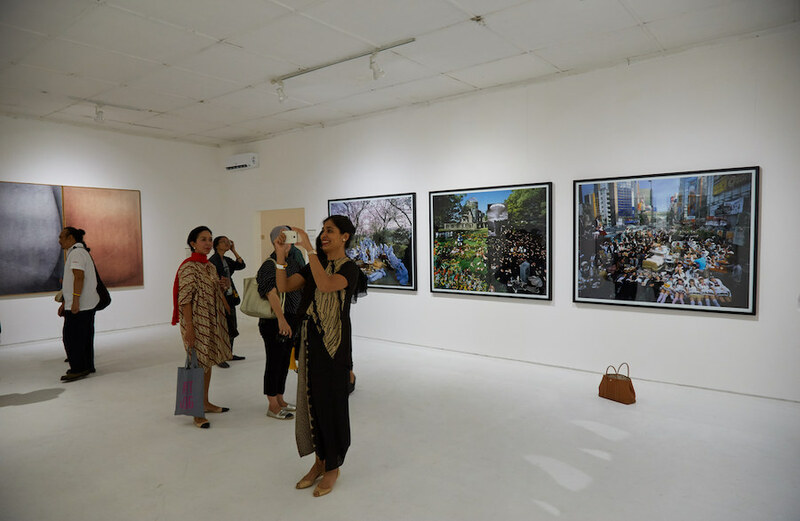 Additionally, other special informational tours were set to take place, such as a curatorial tour and a historical tour of one of the country’s first art institutions, the ASRI. ART|JOG 10 marked the perfect end to my week of exploring the city’s vibrant creative culture. It broadened my perspective on the local art scene, as I saw that in addition to the city’s small community art spaces and semi-illegal street murals, a number of larger institutions and even the local government are putting their support behind Jogja’s blossoming creative scene. I know that I want to visit Jogja more than once in the future, and now I know exactly when the best time is to schedule my next trip. 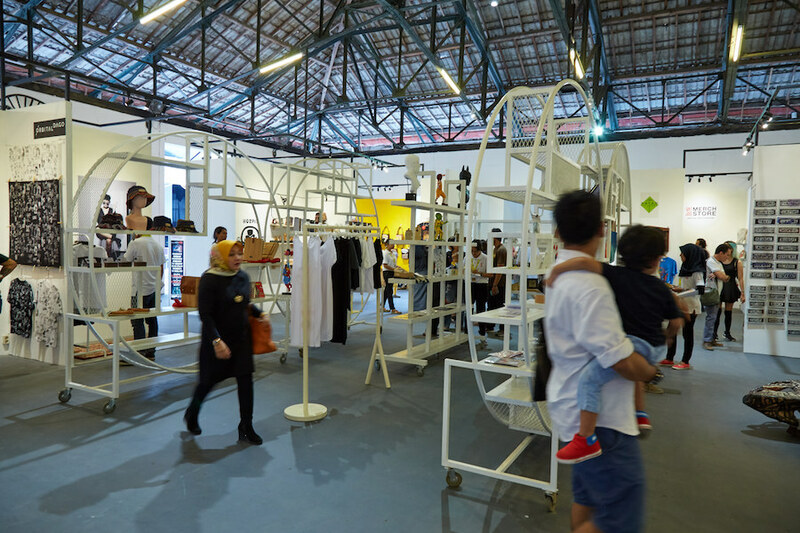 If you happen to be visiting Southeast Asia next year, ART|JOG 11 has already been announced to take place at the same location starting on May 4th, 2018.